fragmanin is a two-channel Audio Essay, an experimental work triggered by the call-out for presentations and performances for the Performance Philosophy Biennial 2019 held in Amsterdam, Netherlands. 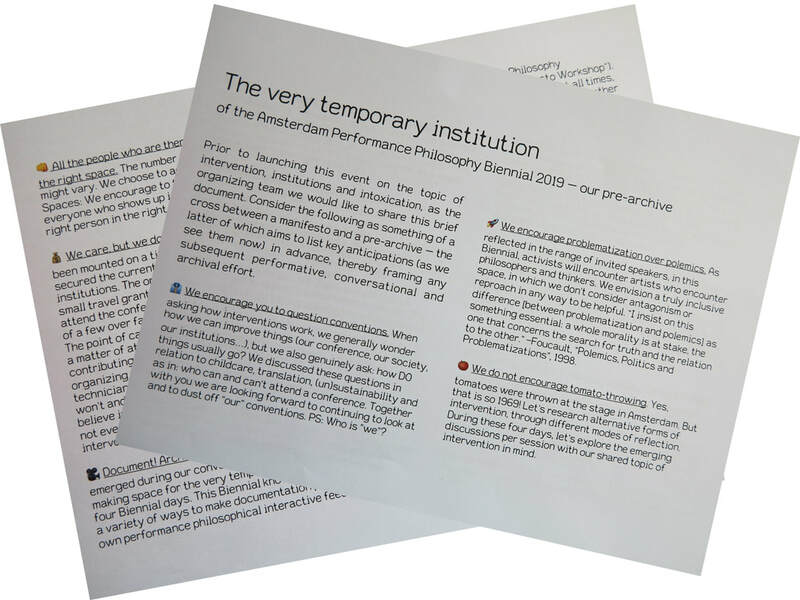 An initiative on the brink of academia, performance art and (public) philosophy in Amsterdam the Biennial was a four-day event staging lectures, performances, interventions and discussions, and brought together artists, researchers, theatre professionals, students, activists and anyone interested in rethinking artistic intervention in its contemporary context. The sound work explores the writing process through the music-like rhythms of speech. Drawing on relationships between spoken, written and written-to-be-read-aloud language fragmanin plays with the collision of writing with live performance. Using material previously recorded by Leona during academic lectures discussing digital literature, the work twists how information is presented and experienced, emphasising how considered and constructed language on the page/screen becomes ‘something else’ when shifted from its repository. Words and their context are de-familiarised and reconfigured to leave logocentrism behind, offering a fresh opportunity to listen, experience, reflect and wonder. The writing process itself is complex and open-ended. The editorial choice used in constructing this work is a form of listeningwriting, and process itself becomes a performer, playing the instrument of voices that speak the written. Rather than using a narrator, Leona experiments with using her ‘editorial voice’, ie she writes this Essay as she de/re-constructs her material, and she experiences the task whilst she undertakes it. In relishing mellifluousness, cacophony, irrationality, sensuality, this work explores how her ‘writing’ is an embodied, fluctuating, challenging, intangible, inebriating sonic event. A form is constructed as she listens to and edits the voices of others, a form open to interpretation, ricocheting and murmuring, swinging and dangling, tantalising both listener and maker – mental Action uncovered as Sound. The work was presented in two different forms during the Biennial. The first was through a sound shower, a speaker that directs the sound so specifically that only the person sitting or standing directly under it can fully hear it. This was installed in the foyer of the theatre in one of the conference venues, the Flemish Cultural Centre De Brakke Grond, so passers-by (both conference attendees and other visitors) could experience it. It was also played through the sound system within the theatre as part of the presentations and papers given during the event, with Leona taking part in the related panel discussion on whether intoxication can be considered as creative intervention in both artistic and political situations. 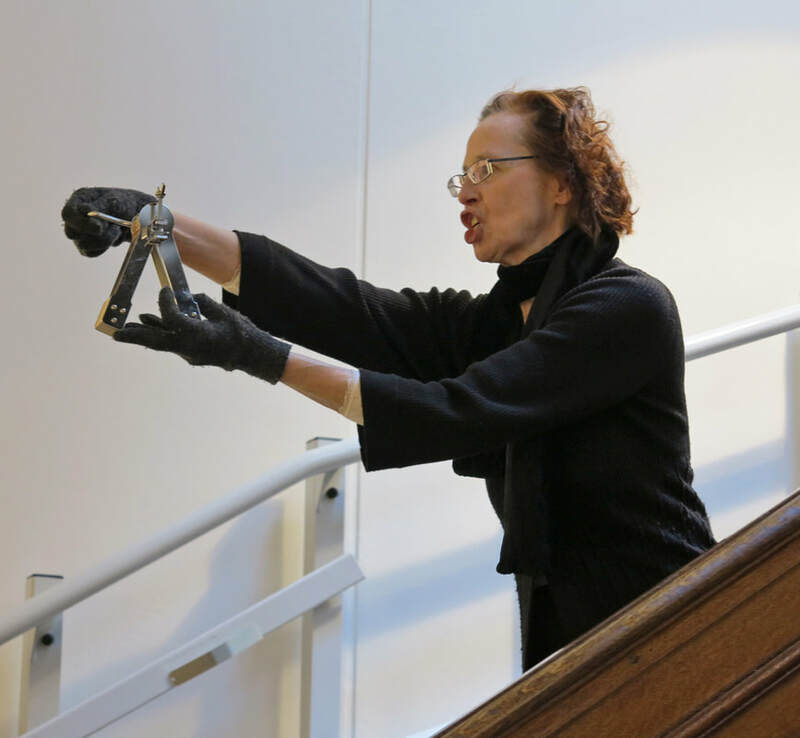 fragmanin inspired another attendee of the Biennial, composer and performer Caroline Wilkins, to create a performative intervention in the theatre foyer. Using both sonic and physical improvised material, she appropriated fragments of the sound work and presented a spontaneous and striking event centred on the chair under the sound shower and the stairs leading to the theatre nearby. Leona intervened in Caroline's conference paper An Expansion of the Admissable: Sound Theatre as Interference, in which Caroline explored intervention as manifested in the form of sonic gesture, one in which a performer body and live audio electronics interact, allowing another third 'mad' world to emerge. Leona used an amplified toy voice changer to become a disembodied voice filling the theatre space, intervening in the paper rather in the style of HAL (2001: A Space Odyssey, Kubrick) as the computer breaks down. Leona's attendance at the conference was made possible by the awarding of a grant by the Biennial organisers to help with related costs.